NORMAN, Okla. (AP) — Last season, quarterbacks and receivers dominated the headlines in the Big 12. Oklahoma quarterback Baker Mayfield won the Heisman Trophy, Oklahoma State’s James Washington won the Biletnikoff Award for the nation’s top receiver and Oklahoma State quarterback Mason Rudolph won the Unitas Golden Arm Award for the nation’s top senior or fourth-year quarterback. The Big 12 has its share of stars at those positions again, but this season they share the marquee with the running backs. 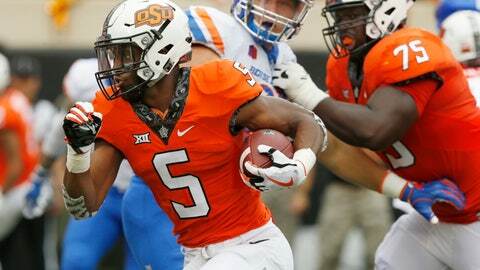 Last season, only Oklahoma State’s Justice Hill averaged 100 yards per game in league play. This season, four Big 12 backs are averaging at least 100 yards rushing per game in conference action — Hill, Kansas State’s Alex Barnes, Iowa State’s David Montgomery and Oklahoma’s Kennedy Brooks. A fifth, Kansas’ Pooka Williams, is averaging 100 yards rushing for the season and ranks in the top 20 nationally in yards rushing per game. Barnes, the Big 12’s leading rusher, is Oklahoma coach Lincoln Riley’s primary concern heading into the eighth-ranked Sooners‘ game against Kansas State on Saturday. The 6-foot-1, 225-pound junior ranks 13th nationally with 112.6 yards per game. Riley said Barnes reminds him of injured Oklahoma running back Rodney Anderson, who was an all-conference selection last year. Barnes ran for 819 yards last season, and he has carried even more of the load this season. He rambled for 250 yards and three touchdowns against Baylor, then followed that with 181 yards and four touchdowns on 34 carries against Oklahoma State. “He’s playing well in all categories, and yet, for the most part, that’s not a surprise to anybody and something we’ve seen in recent years, especially last year,” Kansas State coach Bill Snyder said. Montgomery got off to a slow start this season, but he has posted at least 100 yards in the past three games he has played in. He’s coming off a 189-yard performance in a 30-14 upset of West Virginia. Iowa State coach Matt Campbell has heard some compare Montgomery to Kansas City Chiefs running back Kareem Hunt, a player Campbell coached at Toledo. Brooks is the latest freshman star running back at Oklahoma, following the likes of Samaje Perine, Joe Mixon and Trey Sermon in recent years. He’s coming off a career-best 168 yards against TCU, and he seems to have given Oklahoma the home run threat it lost when Anderson got hurt. Brooks is averaging 10.7 yards per carry in Big 12 games. Sermon has been the power back to balance Brooks’ speed for Oklahoma. He ran for 110 yards and two touchdowns against TCU and has 458 yards and five touchdowns this season. Hill is perhaps the most important piece to Oklahoma State’s success. The Cowboys are 3-1 when he rushes for at least 100 yards and 1-2 when he doesn’t. His best game this season was a 189-yard effort against Kansas. He is climbing Oklahoma State’s career rushing starts heading into Saturday’s home game against Texas. Texas freshman Keaontay Ingram has given the Longhorns‘ running game a boost with 75.5 yards per game in conference play. Williams, a freshman, has rushed for 609 yards this season and averages 6.9 yards per carry. He had 107 yards from scrimmage last Saturday against Texas Tech. He ranks 19th nationally in rushing with 103.3 yards per game.